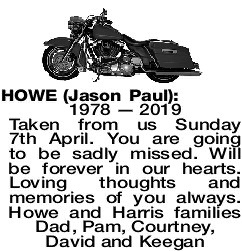 Family and friends are warmly invited to Celebrate the Life of Jason Howe of Belmont on TUESDAY (23.4.2019) in the Norfolk Chapel, KARRAKATTA Cemetery, Railway Rd, Karrakatta, departing the Main Gate at 1.30pm. Jason, We will miss your smiling face and wonderful stories. It was a pleasure to know and work with you. Thanks for all the gym advice. Rest in Peace. You were such a friendly soul, when we moved into the complex knowing no one you made a point of saying hello, always a friendly smile, we will all miss you in the complex Jason rest easy and may you fly on angels wings. Just as you were finding your true self, inner peace and a new zest for life. You had a heart of gold. You will be truly missed Big Fella.